Poland’s new right-wing Prime Minister Mateusz Morawiecki sacked his defence and foreign ministers in a major cabinet reshuffle yesterday (9 January), as he seeks to mend strained ties with the country’s EU partners. The prime minister held talks with European Commission President Jean-Claude Juncker late yesterday, weeks after the EU launched an unprecedented disciplinary procedure against Warsaw over its controversial judicial reforms, which Brussels says threaten the rule of law. 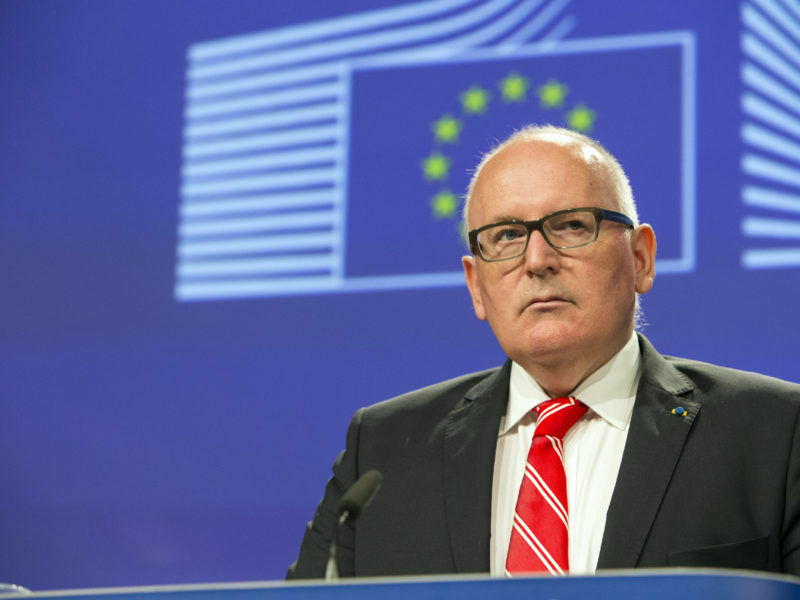 European Commission Vice-President Frans Timmermans announced with a 04:13am tweet that the EU executive had activated Article 7 of the Lisbon Treaty against Poland, due to “a risk of serious breach of of the rule of law”. The pair held “a detailed discussion of questions related to the Rule of Law”, according to a statement released by the European Commission following the meeting. It described the talks as “constructive” and said they also touched on a variety of issues including “the future of the European Union, the Polish position within the European Union” and economic, energy and migration policy. “Our intention is to make the system more effective, more just, more objective,” Morawiecki told a news conference defending PiS moves on the courts after nearly three hours of talks with European Commission President Jean-Claude Juncker. President @JunckerEU and Polish PM @MorawieckiM had a constructive discussion on #FutureofEurope, Poland position within the EU & EU policies on internal market, digital, energy and migration. Ahead of Morawiecki’s departure for Brussels, it was announced that defence minister Antoni Macierewicz and foreign minister Witold Waszczykowski lost their jobs along with environment minister Jan Szyszko, among others, at an official ceremony held at the presidential palace in Warsaw. Interior minister Mariusz Blaszczak took over the defence portfolio, while Jacek Czaputowicz, a deputy foreign minister with centrist views, will serve as foreign minister. “We don’t want to be a dogmatic, doctrinaire or extremist government; we want to be a government that draws together the economy and society, as well as the European and global dimensions with the local level,” Morawiecki, who took office just last month, said as he greeted his new cabinet. 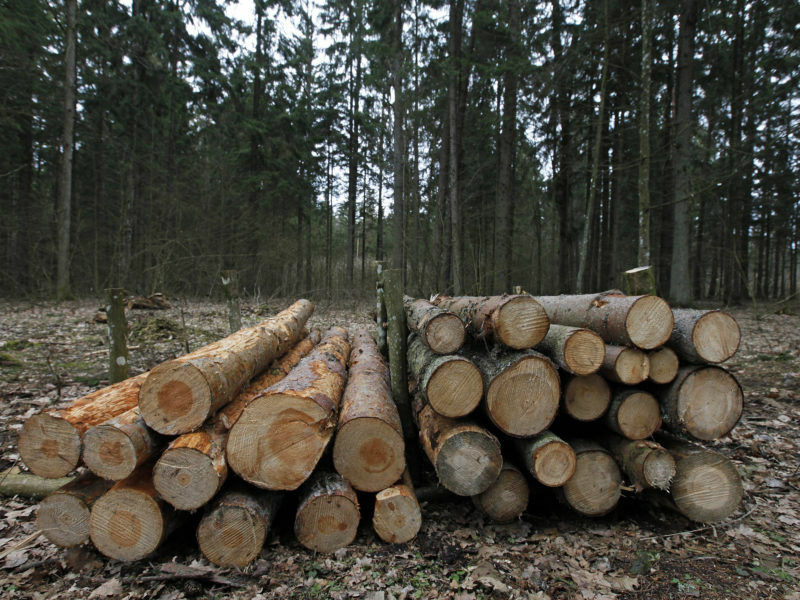 Szyszko had attracted widespread criticism domestically over moves to lift limits on hunting as well as for allowing massive logging in areas of Poland. The dismissed health minister has struggled to contain protests by medical staff in recent months. The European Union executive asked the bloc’s top court yesterday (11 September) to fine Poland for violating a ban on logging in an ancient forest, but Warsaw said it was only trying to preserve unique woods. The outgoing, hardline defence chief has been the PiS investigator into the 2010 plane crash over Russia that killed President Lech Kaczynski – the twin brother of current party leader Jaroslaw Kaczynski – and dozens of other senior Polish officials. 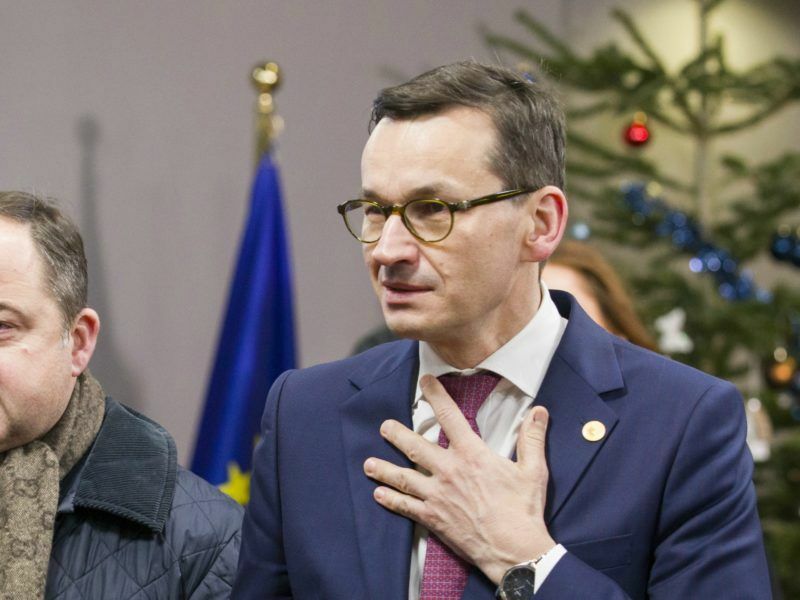 Kaczynski and Macierewicz believe the crash may have been caused by foul play and not pilot error, which was the official cause returned by a investigation by the previous centrist government. Responsibility for the 2010 plane crash that killed Polish President Lech Kaczyński along with 95 other people lay with the then government of Donald Tusk, the late president’s twin brother and leader of the current ruling party said yesterday (10 April) at an event to commemorate the disaster. In a major escalation against one of the bloc’s biggest states, Brussels last month triggered article seven of the EU treaty over what it sees as “systemic threats” to the independence of the Polish judiciary from the nation’s right-wing government. Poland’s new prime minister said on Thursday (14 December) that he expects the EU to impose unprecedented sanctions next week that could strip his government of its voting rights over its controversial court reforms. 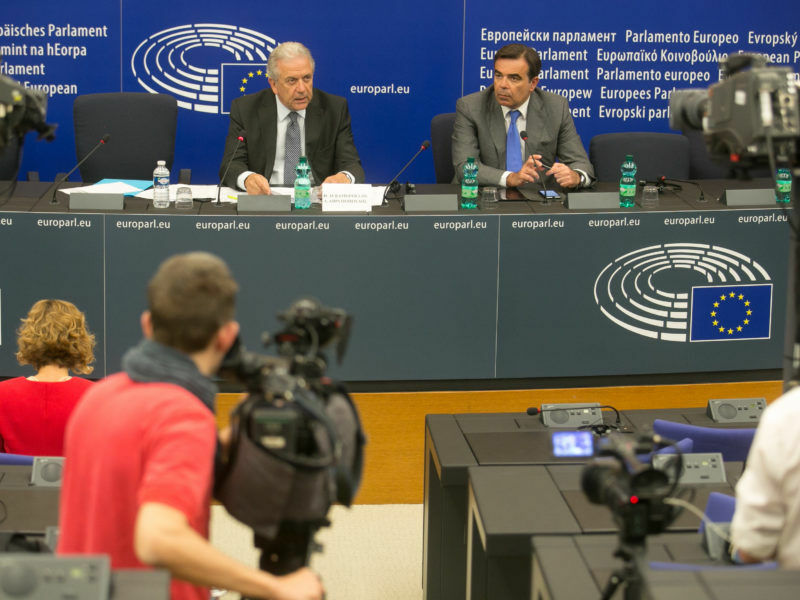 Never before used against an EU member state, the proceedings can eventually lead to the “nuclear option” of the suspension of a country’s voting rights within the bloc. The EU gave Warsaw three months to remedy the situation, saying it could withdraw the measures if it did. But just hours after the EU announcement, a defiant Polish president went ahead and signed the reforms into law and accused the bloc of “lying” about them. Polish President Andrzej Duda inaugurated on Tuesday (December 5) the centenary of independence before the National Assembly. 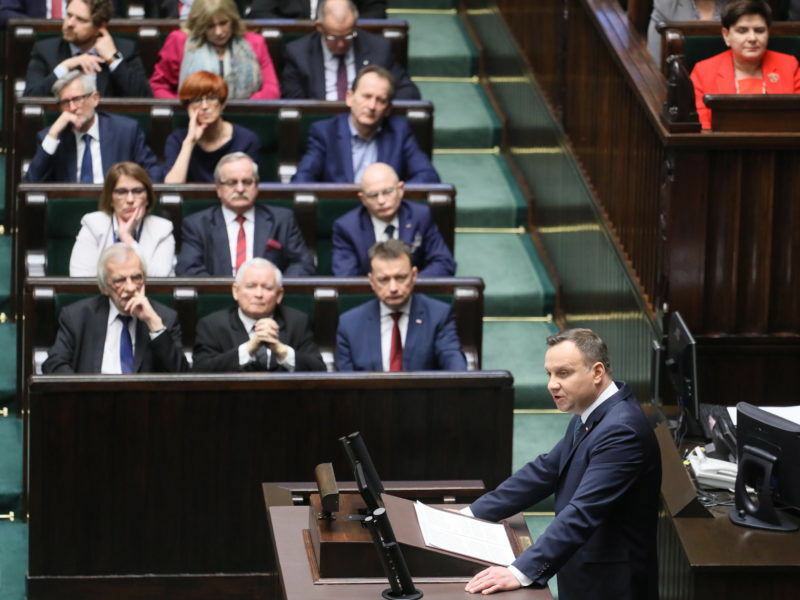 In his address, he appealed for the rejection of “false shame infused with us for years on our national history and identity.” EURACTIV Poland reports. Poland insists the reforms are aimed at banishing the last vestiges of communism from its justice system. 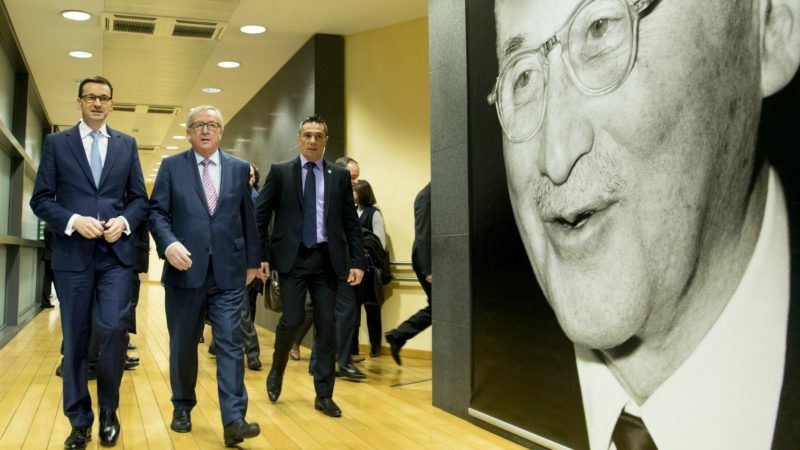 In excerpts of an interview aired Tuesday on German public television, Juncker said he does not want to threaten Warsaw with cutting financial aid. “I am not in a belligerent mood, I want us to move together with the Poles towards a basic consensus,” he said. The row underlines growing east-west tensions within the EU, with former Soviet bloc states like Poland and Hungary refusing to toe the Brussels line on thorny issues including judicial and media independence as well as immigration. The EU has also taken Poland to court over its refusal to accept refugees under an EU quota system. The EU launched legal action yesterday (13 June) against Hungary, Poland and the Czech Republic for refusing to take in their share of refugees under a controversial solidarity plan. 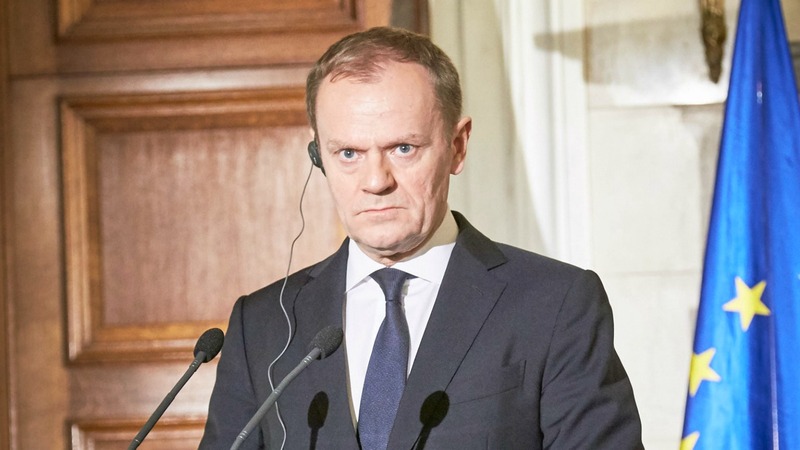 Up to now the the PiS government has had very rocky ties with EU President Donald Tusk, a former liberal Polish premier and PiS arch-rival. 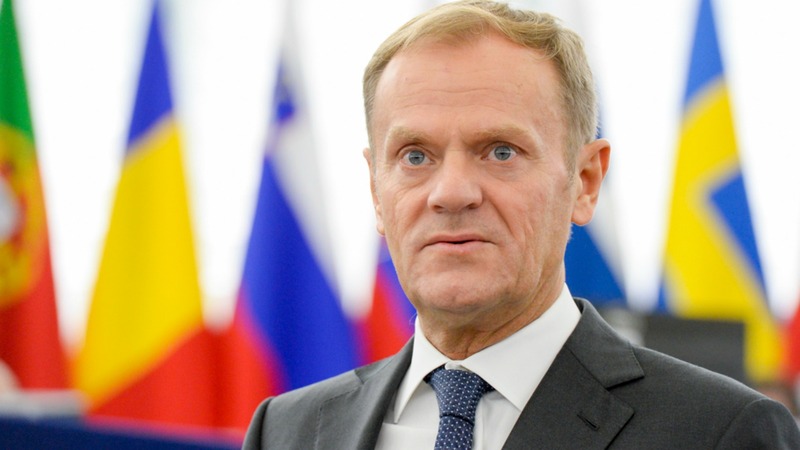 Donald Tusk suffered another attack from Poland’s populist government on Monday (2 January), when Minister of Foreign Affairs Witold Waszczykowski told Krakow radio station RMF FM that he was an “icon of evil and stupidity” and that he should stay “far away from Poland”. Relations have been so tense that Poland was the only country to vote against his reelection as European Council president in March. why don’t you make a comparison with Greece and its influence on rule of law, e.g. the extradiction of Turks who seek asylum to Erdogan? Why don’t you compare with the legislation of other EU members on the same matter? And why don’t you compare your standards and economy with other Member States in Europe?….What about the push of energy in Poland and Germany’s Policy on transport industry? You are biased and repeating the same mantra without any thought. Just get of media such as Euractiv and make your own Research…. anders, your rationale is so childish that’s hardly worth arguing with you. so, what about Greece ? because the leftist Syriza are trying to coerce judges to condemn their political opponents, does that make it alright for PiS to decide which ideologically (read right-wing catho-nationalist) and politically (read PiS supporter) individuals should be a sitting judge ? so what about Turkish asylum seekers ? last time I checked, Poland refused to provide any help to anyine who happen to be muslims. what about “my standards and economy with other member-states in Europe” ? you make no sense, child. maybe you meant to compare Poland’s economy with other EU’s member states ? what does it have anything to do with respect with the rule of law. last time I checked, Russia had higher growth rates than Poland in the period 2001-2010. does that mean that Russia is a better, more liberal, more peaceful country ? what about “push of energy” in Poland ? what does it even mean ? do you realize how tenuous your grasp of reality is. you’ll try every conspiracy theories, no matter how irrational, if in the end it seems to justify your madness. and you dare to call me biased and a parrot …. LOLILOL ?! ?